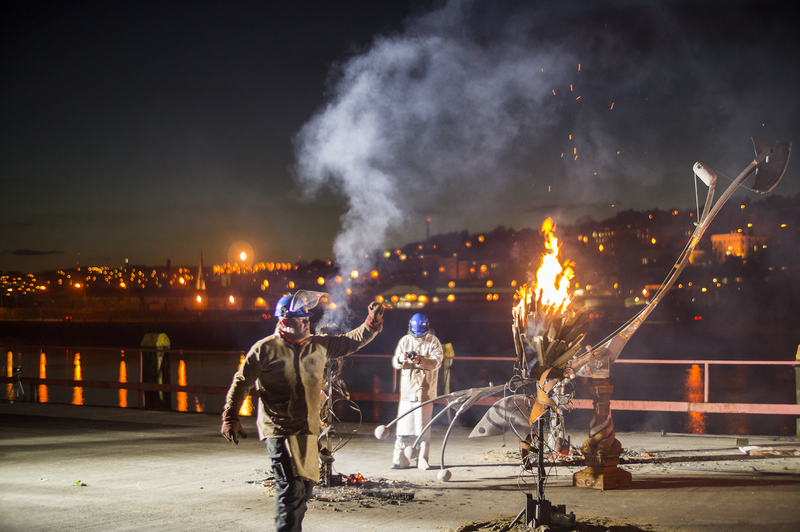 Matt Toole’s interest in the transformation of materials has inspired a series of performance events that highlight the moment when a work of art is created. Focusing on the process of casting iron, his performances serve not only as a means to create objects but to connect the resulting objects to the actions that manifested them. In an effort to bring a sculpture’s inception to light, the act, or ritual, functions to de-emphasize the manufacture of the object as the sole purpose for the act. 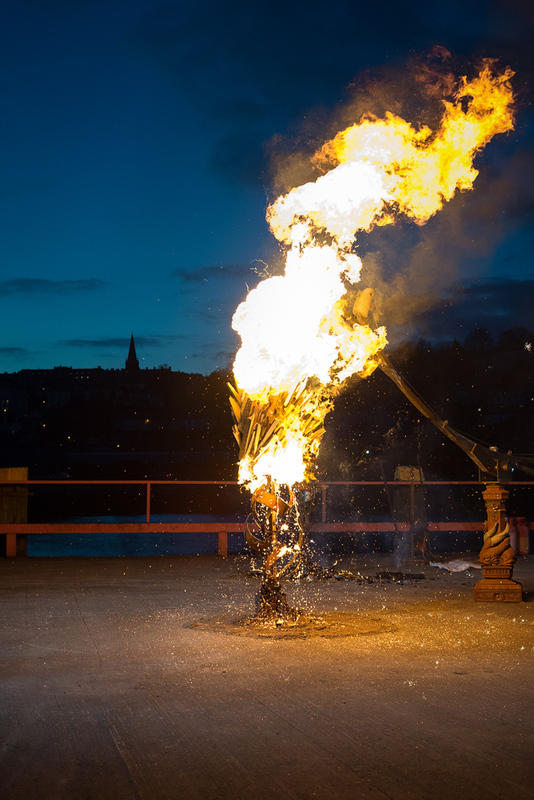 In these performances the structures used to melt, pour, and receive the molten metal essentially function as artworks that create other works of art; utilising fire as a means of destruction while simultaneously employing it as an instrument of origination. 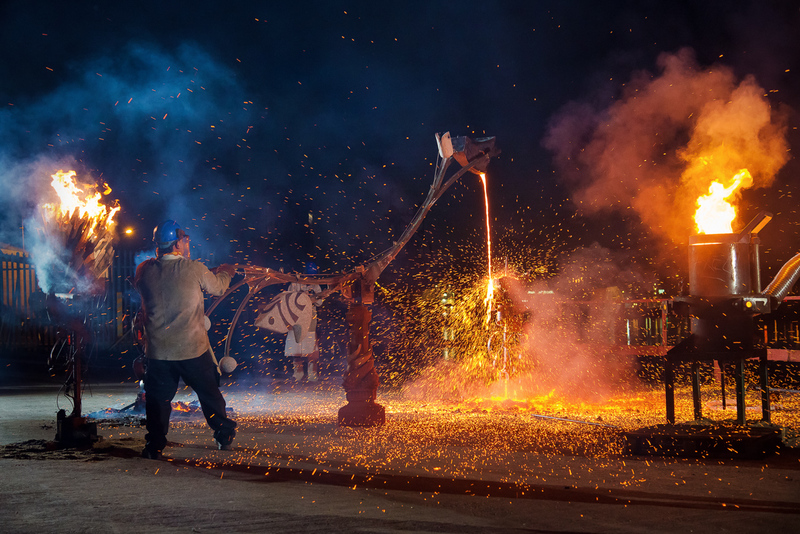 Most often the event is a tribute to the rite of creative expression, focusing on the power of a collective experience rather than that of an individual artist acting alone to create. 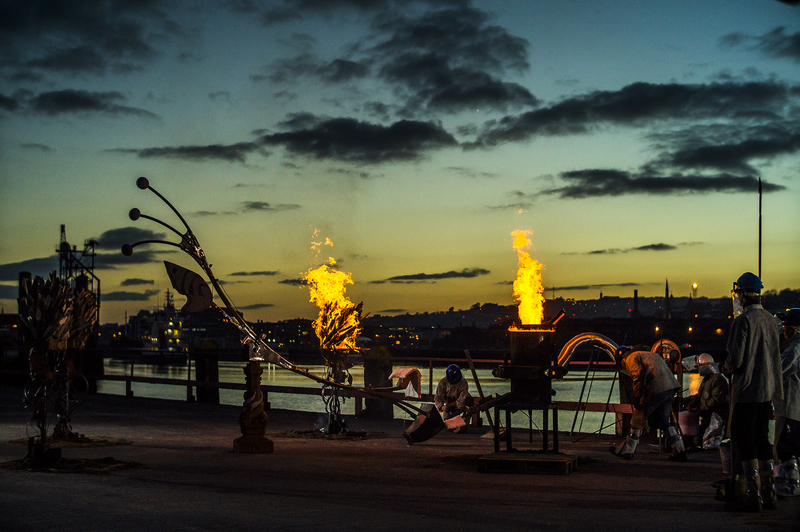 For the Iron R2 project, Matt worked in cooperation with CCAD students and visiting artists to create a waterfront performance that was indicative of his contraption based events engendering not only his process driven performative work but the collaborative, transformative ethos of Iron R2. Matt Toole would graciously like to thank Mick Wilkins (artist) for his support & incredibly generosity; Ronan Bradbury, Mara Muller Tolk and Lynn Dennehy (students from CCAD) for all their work on the pyres; James Hayes and the rest of the CCAD staff for making a new furnace, Axel, for this event. ; Mick O’Shea (Sound artist) and Alex Pentek (artist) for their soundscape collabroation; and finally Donal Dilworth (NSF) without whose help this performance would not have materialised.